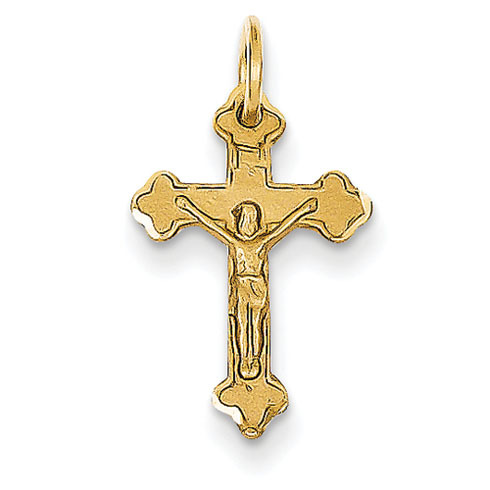 INRI diamond-cut budded crucifix charm is made of 14k yellow gold. Item is 7/16 inch wide by 5/8 inch tall without loop and bail. This item is smaller than a dime. Weight: 0.73 grams. INRI means Iesus Nazarenus Rex Iudaeorem. Nailed to the top of the Cross, this Latin inscription given by Pilate translates Jesus of Nazareth, King of the Jews.